So cute together. They're my favorite Disney couple, even if they're not human. thank you! and thanks for the watch! Really nice, and SOOO cute! You're very welcome! Your art is spectacular, and ALWAYS a real joy to view! Dawwwwww!!! 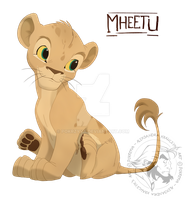 ^W^ Simba's face! This is so adorable!